Burnham Overy Staithe01485 532610work VillageBurnham Overy is made up of two settlements, Burnham Overy Town the original village adjacent to the parish church and Burnham Overy Staithe, a rather larger settlement about 1 mile away and next to the creek-side harbour. Historically Burnham Overy which lies on the River Burn was the port for the surrounding villages of the Burnhams. Until the end of the middle ages, trading ships were able to reach the village, however with silting of the river, commercial traffic switched to the downstream Staithe. Between Burnham Overy Staithe and the sea, a network of tidal creeks reach out trough marshes that fringe this stretch of coast, and finally reach the sea by passing through a gap in the sand dunes known locally as Burnham Harbour. Small boats can reach Burnham Overy Staithe through this gap and creek. 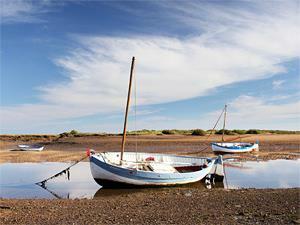 Today Burnham Overy Staithe, and the associated harbour, is a major recreational sailing centre. There is a comprehensive chandlery on the quayside. It is also the point of departure for boats out to the Scolt Head Island National Nature Reserve. The Hero pub and restaurant is a couple of minutes' walk from the quayside. To the east of the Burnham Overy creek, a stunning stretch of the Norfolk Coast path links Burnham Overy Staithe with the sand dunes and Beach at Holkham. Just outside the village centre are the stunning six storey Burnham Overy Windmill and neighbouring watermill. Neither the windmill nor watermill, are open to the public although the windmill can be rented as holiday accommodation.